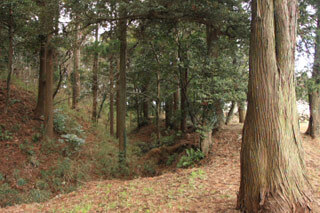 Sakata Castle (坂田城) is one of Hilltop castle located in Chiba. It was constructed in 14th century by Ida clan. It was very important castle to protect Shimousa attacking from Kujukuri beach. In 1590, it was abandoned according to Hideyoshi's Odawara war. The structures of the cantle remains great. It is also very popular Ume spot in Chiba, today. 1. use JR Sobu line to Yokoshiba. Built in: 14th century by Ida clan. Sakata Castle was built by Ida clan who was one of Samurai of Chiba clan. It was a large hilltop castle in Chiba. This castle remains a great conditions. Also, unlike other castles, this castle has many records and pictures that tell the structure of the castle. Ida clan was later became the ally of Odawara Hojo clan and in 1590, they are abandoned by Toyotomi Hideyoshi. Today, because of 1,200 plum trees, it is very popular Ume spot in Chiba.